ՀՀ կառավարության և մասնավորապես սփյուռքի նախարարության անունից ջերմորեն ողջունելով հյուրերին՝ սփյուռքի նախարարի պաշտոնակատար Մխիթար Հայրապետյանը նշեց. Armenian government Gift of Gratitude to the Kingdom of Norway government. 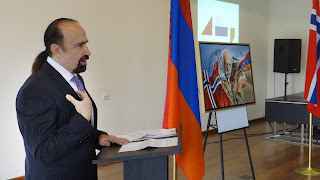 On November 6, 2018 at the event hall of the Ministry of Diaspora, acting Minister of Diaspora Mkhitar Hayrapetyan Officially presented The portrait of Fridtjof Nansen painted by the "Peace of Art" organization's founder, Daniel Varoujan Hejinian to the Honorary Consul of Norway to Armenia, Timothy David Straight, as a gift from the Government of Armenia which in its turn will transfer to the Government of the Kingdom of Norway, strengthening the friendship between the two nations. The event began by accompaniment.of the two peoples National Anthem and was assigned by the RA Prime Minister and organized by the RA Foreign Affairs Ministry and the RA Ministry of Diaspora. Were also present at the event, Ambassador Extraordinary and Plenipotentiary of the Kingdom of Denmark to the Republic of Armenia Ruben Madsen, Extraordinary and Plenipotentiary Ambassador of the Kingdom of Sweden to the Republic of Armenia Ulrik Tidresroy, Ambassador of Finland to Armenia Arya MacKonen and Swedish Embassy Chargé d'Affaires Martin Fredrickson. Mr. Straight expressed his thanks to the Minister and the government of Armenia on behalf of the government of the Kingdom of Norway. 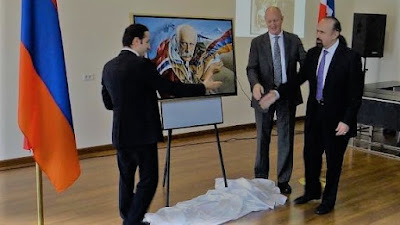 "I was very honoured today, on behalf of the government of the Kingdom of Norway, be presented by the Armenian Minister of the Diaspora Mkhitar Hayrapetyan with a wonderful painting of Norwegian humanitarian and explorer Fridtjof Nansen by Varoujan Hejinian from Boston in the U.S. 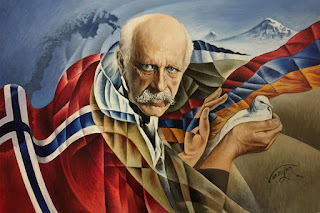 The painting expresses gratitude for Nansen's support for the Armenian nation, the blue stripe on the Armenian flag going through Nansen's hand and into the blue stripe on the Norwegian flag. The warm relations between Armenia and Norway have been ongoing for hundreds of years. Let's build these relations further." 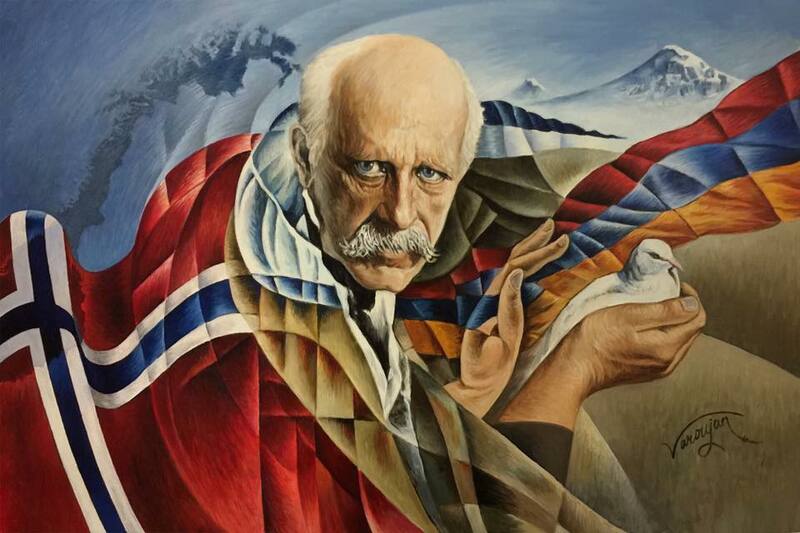 The painting represents the great humanist Fridtjof Nansen's selfless attitude towards the Armenian people, his caring and support, as a result of which 350,000 Armenian refugee survivors of the Armenian Genocide received a Nansen passport. The painting conveys also a gratitude to the Norwegian government for providing humanitarian assistance to Armenia during the 1988 earthquake. 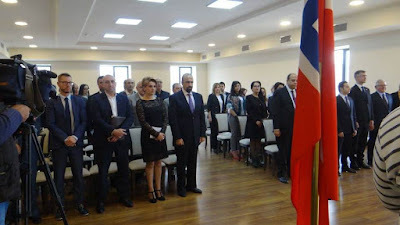 On his opening ceremonial remarks, RA Minister of Diaspora Mkhitar Hayrapetyan noted that Nansen was one of the first to condemn the Armenian Genocide and helped tens of thousands of Armenian refugees find refugees in Armenia and other countries. He also recalled missionary Bodil Katharine Biørn, who worked as a nurse in Western Armenia and saved thousands of homeless and ill children. Gagik Ghalachyan, Head of the European Department of the Ministry of Foreign Affairs, conveyed the welcoming speech of RA Minister of Foreign Affairs Zohrab Mnatsakanyan. The governor of Lori region Andrey Ghukasyan also made a speech. “Shortly after the 1988 earthquake, the tents of the Norwegian Red Cross were deployed in Spitak, Lori Region, which became one of the first operational aid points for earthquake victims. Later, in March 1989, the Norwegian Red Cross was built and put into operation by the Spitak Hospital. Today, on behalf of the Armenian people and especially all the people of Lori on the occasion of the 30th anniversary of the earthquake, I express our gratitude for supporting Armenia in difficult situation", said the governor of Lori. Daniel Varoujan Hejinian, the author of the portrait, presented the story of the creation, in his speech Varoujan said: " The idea of the portraiture of "Nansen, Bridge of Friendship and Peace" was born in me back in 2017, and then I started the creation of the painting on canvas. The portrait would have been passed to the Norwegian government and to the people of Norway by a representative of the Armenian government on October 10, 2018, on the occasion of Nansen's 157th birthday as a gift of gratitude from the Government of Armenia and the Armenian people. But Armenia's internal political situation and the lack of time brought us to the decision to transfer the painting to the Government of the Kingdom of Norway through its Honorary Consul Mr. Timothy David Straight. Dear participants, who can feel the thorny path of emigration rather than the migrant's child, who has seen the pain and sorrow of that suffering in the eyes of his parents. I have looked at the future through their eyes hoping to keep the humanity away from such misfortune. For this purpose, I founded the "Peace of Art" organization in 2003, which uses art as an educational tool to bring awareness to the universal human condition and promote peaceful solutions to conflict. On this occasion it is worth remembering the great humanitarian Fridtjof Nansen's message of Peace. "If nations can resolve their differences, they can easily establish lasting peace." The theme of the portrait symbolizes the friendship between the Armenian and Norwegian people. In the center of the painting is the portrait of Nansen and in his background is the flag and the map of Norway, in his front is the Mount Ararat and Armenia with its tricolor, whose blue color symbolizing peace passes through his fingers uniting with the blue cross of the Norwegian flag, turning into a bridge of friendship between the two countries. In his right hand there is a dove symbolizing Nansen's struggle for peace, for which he was awarded the Nobel Peace Prize. The painting also reflects the goals of the "Peace of Art" organization, www.peaceofart.org contributing to the development and strengthening of the friendship between Armenia and Norway, expressing the aspiration for peace by the two nations and states. It is a great honor for me to paint "Nansen, Bridge of Friendship and Peace", the portrait of Norwegian polarizer, great humanist, Nobel Peace Prize laureate, friend of the Armenian people, first Honorary Doctor of Yerevan State University Fridtjof Nansen, to pay my tribute and homage to his activities in the direction of protecting the rights of Armenian refugees and orphans. " Varoujan also expressed his thanks to RA Minister of Diaspora Mkhitar Hayrapetyan for presenting him properly and evaluating his work, he added that he is the youngest minister in Armenia and the presence of the young minister is important for Diaspora youth to be inspired and contacted with their homeland. He also expressed his gratitude to the RA Prime Minister for the assignment to transfer of the painting, as well as to the RA Government, the RA Ministry of Diaspora, the RA Ministry of Foreign Affairs, the Head of the European Department of the Ministry of Diaspora Karen Avanesyan, the First Deputy Prime Minister Liana Simonyan, representative Heghine Gevorgyan for the organization and implementation of the event.